A friend of mine recently sent me a CNN article that I found fascinating. It reveals that only 30% of American Citizens have a passport. This means that people in the United States just aren’t traveling as much as the rest of the world. Why is that? The author, Natalie Avon, does a great job at explaining possible reasons for this sad statistic. One being that the United States is so big and diverse that many people don’t see the need to leave the country. I agree that our country is awesome and so unique from one state to the next. I’ve lived in Seattle and New York and both have a completely different feeling . From the people to the food, the atmospheres of both cities are very distinct. However, there’s something about stepping out of your comfort zone and experiencing a place where people speak a different language. Even holding another countries currency in your hand is exhilarating to me. It’s the idea of knowing that you’re totally immersed in another culture (different food, clothing, religious traditions, etc.) that gets my adrenaline pumping. Some would argue that you can experience these things in the U.S. via Chinatown in New York or Little Ethopia in Los Angeles but there is no way you can get the true feel for an entirely different culture through a couple of ethnic shops and restaurants dotted along U.S. city streets. You can’t possibly think you’ve experienced the Spanish lifestyle without participating in a siesta (something coming soon to my Bucket List by the way). Another reason for the lack of travel by Americans, according to Avon, is intimidation and ignorance. We only hear about the scary aspects of countries such as crime rates and natural disasters therefore many Americans think it’s dangerous to travel abroad. This cannot be more wrong. Most places are perfectly safe for U.S. travelers and if you have any doubts there are plenty of resources to keep you informed before you depart such as travel.state.gov. Here you can read travel warnings and prepare for your trip abroad. For the most part, traveling in another country is no more dangerous than traveling within the U.S. just use caution and be aware of your surroundings and you’ll be fine. We shouldn’t overlook the fact that our countries work culture is vastly different than others, especially when it comes to Europe. I’ve heard before that Americans live to work while others work to live. This is a perfect description in my opinion. According to the article, Europeans generally receive between six to eight weeks of vacation time compared to a measly average of 17 vacation days in the U.S. Believe it or not but many American’s don’t even use all of their time. It’s as if they feel guilty for not participating in the daily grind. Lets not forget about the cost of travel. People think that it’s too expensive to travel overseas but I’ve found that to be untrue with proper planning and budgeting. 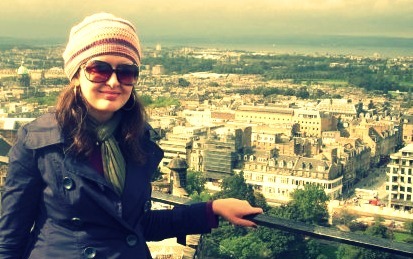 I’ve once spent an entire day in Edinburgh, Scotland doing nothing but free activities. This included touring a museum so big I didn’t have time to see it all, touring a church older than my entire country and enjoying free wi-fi to connect with my family back home. I don’t travel abroad nearly as much as I’d like to and fully plan on changing that in the future. My goal is to actually live in another country one day. I truly believe that one only benefits from traveling abroad. You may have to apply for a passport (super easy) and learn a couple of key phrases to help you navigate whatever country you’re in but the experiences you’re going to leave with are priceless. A special thanks to my dear friend, Jason Coffey for sharing the CNN link with me. I hope China is treating you well! Jason!!! I glad you liked the post. I would love to Skype sometime. I’ll email you my information so that we can. I loved meeting your parents and cannot wait until you get back to the ATL so we can hang. XOXO.